Red LED headlamps and flashlights help preserve your night vision while you find, compose, and photograph your astro-landscapes. I have found it necessary in my 'NightScape' work to have a headlamp or flashlight that has both a powerful white light and a dimmer red light. 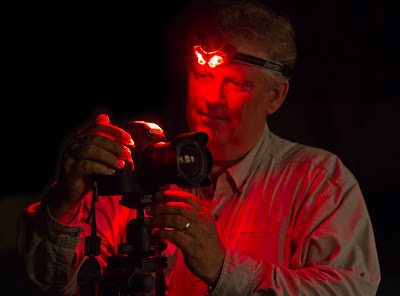 They should have a strong white light that will help you find your way to the shooting location, and a red light for helping you set up your tripod and adjust your camera while your eyes re-adjust to the darkness. 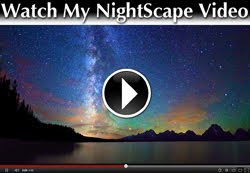 It can often take as much as 30 minutes for you to get your "night vision" and clearly see the Milky Way after having been exposed to bright lights, especially in the blue-cyan wavelengths—which are most common with today's LED lights. Using a red light will help to not only help preserve your night vision, but shorten the recovery time once you turn off the bright white lights. It is also good etiquette to use a red light when in a group setting, such as a workshop. Recent studies have indicated that intensity is just as important as the color of the light, so having a low-intensity or dimmable red light is also important. Choosing the right headlamp: Headlamps have become increasing popular in the past few years with hikers and other outdoor enthusiasts because they allow for hands-free use. LED headlamps are much more efficient than earlier tungsten lamps. They produce more lumens, burn much longer on even smaller batteries, and have "lightbulbs" that almost never need replacing. A few years ago, there were only a handful of companies making headlamps. Now there are scores of brands, with many models from each. Finding the right headlamp for night photography use can be a little confusing. When you limit your choices only to those that also have a red light, the field narrows considerably. However, to make it even simpler, I'm going to review just two brands—one that is a leader in the field (Petzl), and the other is a general, consumer product (Energizer 7 LED), available almost anywhere. Petzl is company that has lead the way in quality and innovations. This French company is a world leader in the design and manufacture of vertical sports equipment (i.e mountaineering, climbing, work-at-height, and rescue), and headlamps. In this review, I will concentrate on only three headlamps in their Universal Series. These units are available at REI, LL Bean, BackCountry.com, GearCoop.com and Amazon.com. Petzl Tikka XP 2 Headlamp (about $55 at REI). A single high-output LED provides even, white lighting. Advanced optics optimize the reach of the beam to 68 meters. A red LED positioned to the side of the white LED lets you preserve your night vision. One push-button is used to toggle through lighting modes and two colors. The headlamp tilts to point the light where needed. Three white lighting modes: maximum (80 lumens @ 70 hours), economic (13 lumens @ 190 hours) and strobe. Two red lighting modes: maximum (unpublished lumens @ 100 hours) and strobe. You can choose between wide or focused beams with a flip-up Wide Angle diffuser lens. Battery charge indicator light comes on @ 50% remaining power. Uses 3 AAA alkaline batteries (included). You can also purchase the optional CORE system lithium rechargeable battery (about $28 at Amazon) or purchase the Petzl Tikka XP 2 Core Headlamp (about $72 at Amazon). The Petzl Accu lithium battery is rechargeable up to 300 times, making it equivalent to 900 AAA alkaline batteries (the lithium battery is also operational in extreme temperatures from -40° to 140°F). PROS: Powerful and efficient light/optics, with lots of advanced features and adaptability. Red LED is dim enough to preserve your night vision. CONS: Expensive. You must toggle through the lighting modes to get to the one (and color) you want, which could be somewhat blinding to yourself and annoying to others (although the Petzl Tikka XP 2 Core Headlamp does have a memory feature where the last color used remains in memory for the next use). Petzl Tikka Plus 2 Headlamp (about $38 at Amazon). This headlamp is almost identical to the Tikka XP 2, except that it does NOT have the flip-up Wide Angle diffuser lens to change the beams between wide and focused; and it's power is slightly less: Advanced optics optimize the reach of the beam to 40m (vs. 68m for the XP 2). It's maximum white beam delivers 70 lumens vs. 80 lumens (@ 58 hours vs. 70 hours). It's economic mode delivers 10.5 lumens vs. 13 lumens (@ 185 hours vs. 190 hours). The red LED is still rated at 100 hours. You're going to save about $15 over the XP 2, but you'll lose a little power and efficiency; and the use of a wide Angle diffuser lens. Other than that, the pros and cons are still the same. Petzel Tactikka Plus Headlamp (about $41 at Amazon). This headlamp uses an older, 4-LED design with 4 lighting modes (via a single button) and a red flip filter to change lighting color. Maximum light output is 35 lumens @ 100 hours, with a maximum beam reach of 32 meters. It has 3 other modes: Optimum (23m beam reach @ 120 hours), Economic (15m beam reach @ 150 hours) and strobe. Headlamp tilts to point light where needed. Uses 3 AAA alkaline batteries, which are included (it is not compatible with the CORE lithium system). PROS: The red polycarbonate flip filter allows quick change between white and red lighting, and therefore gives the red lighting all the economic modes and dimmable benefits! CONS: The low-tech design is not as powerful or as adaptable as the more advanced Tikka series, and it has only one beam pattern: wide. Despite this, it is a very durable product with run time specs that are high for its class. 20" spot circle @ 6 ft.
Energizer 7 LED Headlight (about $16 at Amazon). The Energizer pivots to aim light where needed. It uses seven LEDs and a push button switch to offer 4 light modes: spot (3 white LEDs with 21 hours of run time), flood (2 white LEDs with with 30 hours of run time), spot+flood (5 white LEDs with 16 hours of run time @ a maximum of 45 lumens), and red night vision (2 red LEDs with 30 hours of run time). 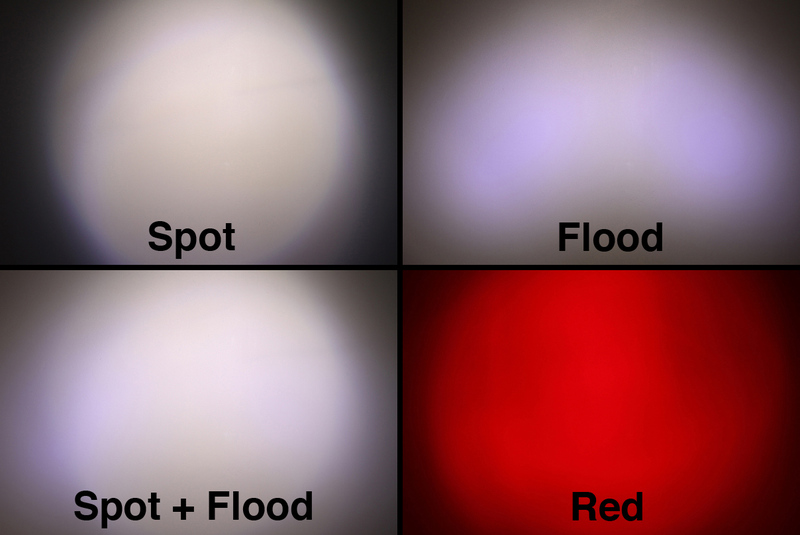 The light patterns from these four modes are displayed here to the left (I took all photos from the same distance, with the same exposure, and white balance). It is powered by 3 AAA batteries (included). My measurements rate the two red LEDs at about 5 lumens, which is dim enough to protect your night vision. Note: Energizer may be in the process of updating this product, as some package specs have the white "area" (spot+flood) rated at 58 lumens, with a light beam reach of 30 meters, and a battery run time of 14 hours. PROS: You get quite a bit of power and options for your money, and the product is available almost everywhere sporting equipment and home improvement products are sold. If you are just an occasional night photographer, this would be my first choice. CONS: Like the Petzl Tikka models, you must toggle through the lighting modes to get to the red night vision mode. This requires you to shield your eyes, or the headlight from others standing near by as you click through all three white settings. I found the soft plastic lenses that cover the LEDs and focus the beams are easily scratched over time (if allowed to rattle around in your pocket or camera bag with hard objects) and can cloud and distort the beams. I'd suggest making a protective bag out of an old pair of socks (cut off the top part if the sock is too long). The plastic lenses also allow some stray light to glare into the eyes of people who are standing to the side of you (a little annoying at times for them). Maximum Battery Life or Run Time: I think it's important to mention that these times are for total length of output, or until the battery is exhausted, and the LED fails to produce usable light. I typically will replace my alkaline batteries long before this time—usually halfway into the manufacturer's maximum number of run time hours. This is because alkaline batteries have a gradual decline in performance over time, and by the halfway mark I'm not getting enough light to satisfy my needs. For this reason, I always carry three extra AAA batteries in my camera bag. Petzl users who opt for the CORE system lithium rechargeable battery or who purchase the Petzl Tikka XP 2 Core will not experience the gradual decline in battery performance, as the lithium can be programmed (via the Petzl OS software) to run at peak output until the battery is exhausted—which is why I still carry the three extra alkaline batteries (as the Petzl Tikka series can switch back and forth from lithium to alkaline). My Conclusion: I liked the Petzl Tikka XP 2 for its high-tech adaptability, its power, longevity, proper red LED output. However, most people don't want to pay this much for a headlamp unless they use it a lot. For those who are medium users, I would recommend the Petzel Tactikka Plus because it had the most control over the red night vision light (three different brightness settings and the most hassle-free way to change from white to red), and it still had decent white light power and longevity. It's biggest drawback for me was that it does not have a focused beam (spot) capability to reach out way ahead of me on the trails. However, for general use it is a great light. The Energizer 7 LED came in as a close second because of its many features and low price (the Energizer would be my first choice for the occasional night photographer). How I work at Night: I use both a headlamp and a handheld flashlight. Because I like a lot of far-reaching power on my headlamp, with a long run time, and the ability to use lithium for cold winter photo shots, I use the Petzl Tikka XP 2 Core. As I near the end of a long hike, become comfortable with my surroundings, and start setting up my photo equipment, I switch to the red light. As I continue to make adjustments, or wait for weather conditions to change (especially when working around others), I sometimes will shut off the headlamp and switch to a low-power, handheld LED flashlight. Although it is not as convenient as a headlamp, a handheld flashlight offers more control. My Red LED Flashlight: Smith & Wesson Galaxy 6 LED Flashlight (about $21 at Amazon) is a dual switch flashlight that utilizes two separate on-off push buttons, giving me a clear choice between the 3 White LED mode (12 lumens) and the 3 Red LED mode (5 lumens), without the confusion and safety hazards of a single switch mechanism. The shatterproof LED diodes last over 110,000 hours, and should never need replacing. The flashlight's length/diameter is 7"/1" and weighs 6 oz. with 2 AA batteries (included), providing a run time of 80 hours. The light is constructed of precision machined 6063 anodized aluminum, and includes a nylon holster. Some of my aviation associates had first brought this flashlight to my attention. They use the red light mode to check their maps while flying at night. Great article Royce. Do you have any recommendations for a neutral white light that does not give any blue or other color tints when light painting? I picked up the Brinkmann Dual Xenon after seeing your vid a month or so ago. Its VERY nice but does have a off color tint and is sometimes just too bright even when pulsed briefly. Love your work and blogs/vids. I have been looking for ages for a new headlight with red light, but think I will just go for the S&W Galaxy as I already have a Petzl & its "menu" of functions has always been frustrating to get the one I want & I always seem to blind myself or others. - Welcome to DeSantisHolster.com, your online source for the finest Concealment Holsters, Inside the Waistband Holsters and Gun Holsters for every major weapon manufacturer and model. Nice review. Thanks for this post. Great review. Would love to know if you use your flashlight for light painting or a different light. Do you want to get auto spare parts with high quality, we provide the original and good quality in car parts. here are options for the headlights, taillights, bumper bars, mirrors, indicators, wheel studs, shock absorbers, cab mounts, grille and drag link. Extraordinary review. Would love to know whether you utilize your electric lamp for light painting or an alternate light.